I bought a little stack of vintage Hit Parader magazines on eBay some months ago, and I've been enjoying using them for collages. They aren't image-heavy, but they have plenty of bits of text to experiment with; I've used lines of text on my collaged greeting cards and also for found poems. 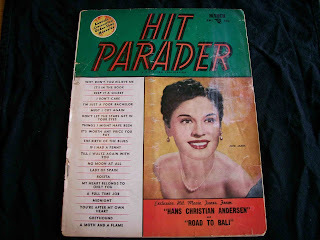 The magazine used to publish the texts of popular song lyrics. There are some cool tiny images, especially in the ads in the back. Anyway, I've shared pictures that show of the results of me cutting up these magazines (collages, poems, etc! ), but I can't remember ever posting a photo that shows an original "whole," so here's the cover of a 1953 issue of Hit Parader. I have another issue with Lucille Ball on the cover, and I haven't figured out the best thing to do with it yet. I've been feeling a bit under the weather. But I did have an article appear online recently that I thought might interest some of the readers of this blog. It's a little reflective piece on how to handle criticism. We've all had difficult feedback (and we'll all have plenty more! ), and I hope the ideas in the article are helpful to someone somewhere. If you have other suggestions about what's helped you in this area, please do share in a comment on this post if you have a moment. And it turns out that I did more of those hay(na)ku collages back in 2010 than I remembered. I got to looking at my Flickr photostream and found quite a few. I added three new collages that I made today, tagged all the old ones, and put everything together into a hay(na)ku set on Flickr. I happened to find a post today where someone linked to my blog as a place to find examples of poems in the hay(na)ku form. I decided to go back and label all the posts where I posted poems in that form--I did a series of collage pieces in 2010 which incorporated tiny poems using the hay(na)ku structure. Here's a link to the hay(na)ku poems I've posted. Looking at them makes me want to return to the form; it's fun, and it works well as a way to experiment with small bits of found text. If you want to write a hay(na)ku, the rules are simple: the first line has one word, the second line two words, and the third line three words. I also like to do sequences where I reverse the word count in some of the stanzas, alternating 1-2-3 and 3-2-1 patterns. The form was created by a contemporary poet named Eileen Tabios, who does a lot of cool projects, including editing Galatea Resurrects, a great collections of reviews of small press books. I saw some crocuses blooming yesterday, and they reminded me of a poem I wrote many years ago. I'm not sure exactly when I wrote this--I'm guessing 15 years ago. I can say for sure that this poem appeared in Bellowing Ark, a local literary magazine (which the Bellowing Ark website tells me is now defunct). Well then, here's a poem I wrote in the spring when I was in my 20s. purple and white, beside the cemetery.